How’s this for a number? 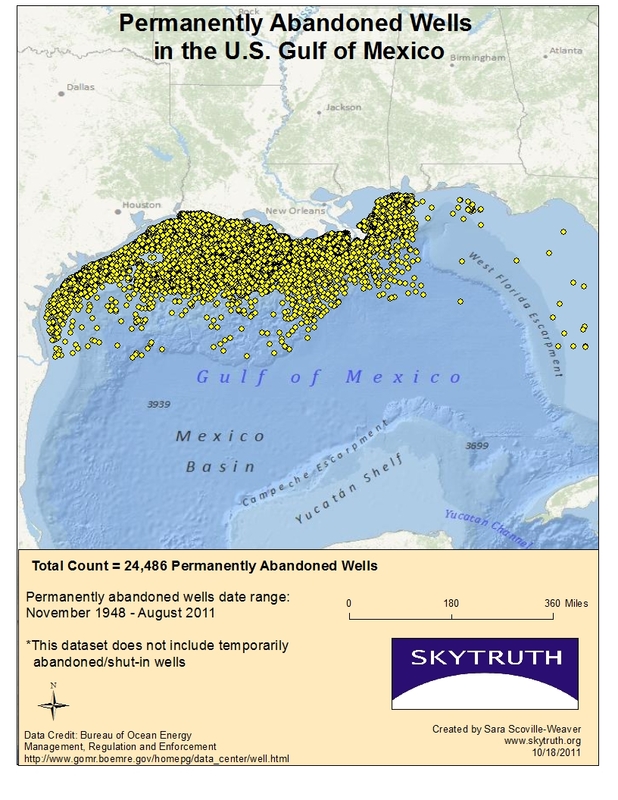 According to data released by the Bureau of Ocean Energy Management and Enforcement, there are currently 24,486 known permanently abandoned wells in the Gulf of Mexico, and 3,593 “temporarily” abandoned wells, as of October 2011. These wells range in dates of abandonment from as early as 1948 to August of this year. This includes some “temporarily” abandoned wells from the 1950’s! That is a pretty loose definition of “temporary” in this analyst’s opinion. It is important to remember that even in the case of permanently abandoned wells, degradation of plugs and casings is not uncommon, as many were sealed before strict regulations were implemented or before the sealing technology used today was available. The obvious question: Are these abandoned wells still capable of leaking oil into the ocean? However, good news may be on the horizon for this “Ocean of Holes.” President Obama announced last year that all temporarily abandoned wells must be plugged and all non-producing platforms be removed. According to BOEMRE’s data, which is displayed in this analysis, these 3,500 well records are still on the books for as late as August 2011. Guess the jury is still out as to when all those “temporarily” abandoned wells will be properly plugged. Furthermore, this policy means that if these wells are sealed and no longer classified as “temporary” then another 3,500 wells will become “permanently” abandoned, thereby adding to the number of wells which have traditionally been minimally inspected and maintained. The Deepwater Horizon disaster called an unprecedented amount of attention to this long-neglected issue and it is crucial that this problem remain one of concern to the public and Congress. 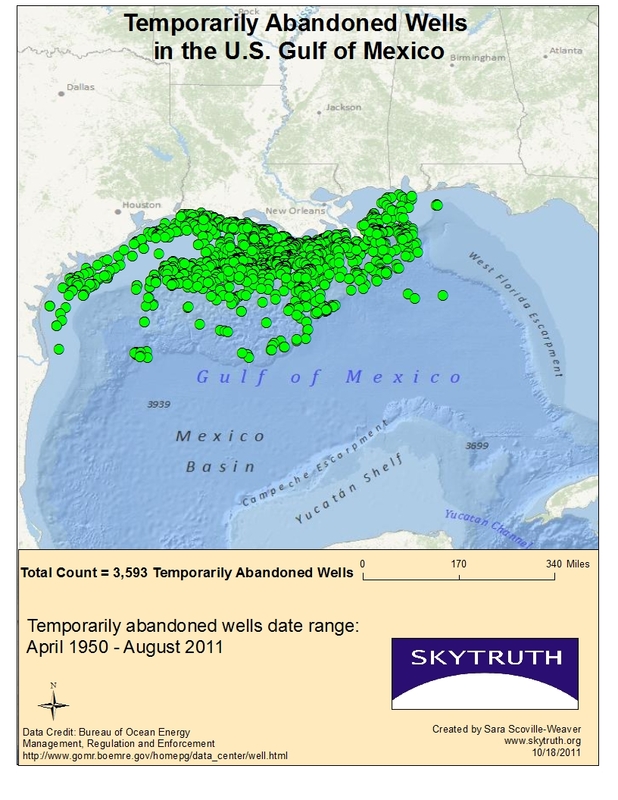 I cited this in my new report, BP among 300 new drilling permits amid 28,000 unmonitored abandoned wells in Gulf of Mexico. Thanks Rady. This is another one of those "stealth" problems: the more infrastructure we build, the more burden we have to monitor, inspect and maintain it. When it's wells onshore and in plain sight we have a good chance of detecting any leaks, corrosion or other signs of breakdown; but when the wells are sitting on the seafloor, it's just one big question mark. 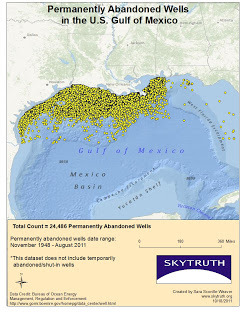 The wells that concern us most are any deepwater, high-pressure wells that are 1)"temporarily" abandoned, often for years without being permanently plugged, as revealed in the AP investigation last year; 2) abandoned due to technical problems encountered during drilling; 3) abandoned for economic reasons. 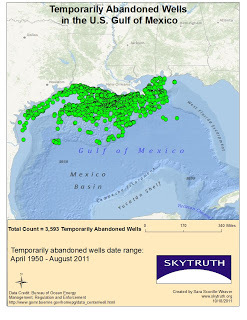 For old, depleted, low-pressure wells – which probably constitute most of the abandoned wells in the Gulf right now – I don't think there is much risk of a significant spill. But as we drill more and more in deeper water to greater geologic depth, we're certainly going to have more abandoned high-pressure wells in the future, like BP's failed Macondo well. 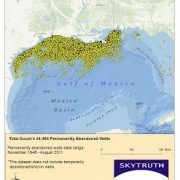 Steel rusts; concrete crumbles; and the Gulf seafloor is geologically dynamic, crisscrossed by shallow faults and seafloor landslides (like the one that wiped out the Taylor Energy platform in 2004, causing a continual leak that still hasn't been fixed – in shallow water close to shore). How "permanent" is the seal on these abandoned wells at sea, even when it's done perfectly by the book? Are we just kicking this can down the road for our grandchildren to deal with?